TOKYO, Oct 12 (TerraViva) – Foreign donors are rushing into Burma, whose government has been pushing the right political buttons as part of its democratic reform process. But development planners and Burmese activists here caution that the best approach should still be ‘easy does it’. 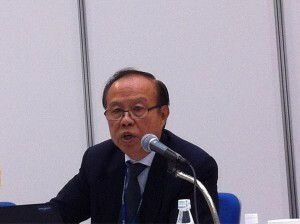 “Please, please, please don’t rush in,” Khin Ohmar, coordinator of the Thailand-based Burma Partnership, said at a discussion organised by civil society groups led by the Washington-based Bank Information Centre at the IMF-WB Annual Meetings in Tokyo on Friday. “A lot of people still feel sceptical (of the civilian-led government’s promise of a people-centered government),” said Thein Swe, a Myanmar professor who works at Thailand’s Chiang Mai University and who has also worked with the Myanmar government. Khin Ohmar and Thein Swe spoke after officials from the World Bank and Asian Development Bank (AsDB) said they were treading carefully for now and studying programmes to pursue or fund even though they have opened offices in the country. Japan is Myanmar’s largest creditor so far, and has said it will give priority to aid to Myanmar, where elections led to political and economic reforms after the emergence of the civilian-led government of President Thein Sein in March 2011. On Oct. 11, Japanese Finance Minister Koriki Jojima said Japan would resume yen loans to Myanmar early next year, after clearing that South-east Asian country’s loans of 500-billion yen (6.3 billion U.S. dollars), to help it get back on its feet. In April, Japan agreed to cancel some 60 percent of Myanmar’s loans. Tokyo will also give bridge loans to help Myanmar refinance its loans to the World Bank and the AsDB that have been in arrears for a decade. Annete Dixon, World Bank director for South-east Asia, explained that these bridge loans would give Myanmar a longer time to pay the outstanding amounts. “But Myanmar is unlikely to be eligible for debt relief,” she pointed out. Overall, she said, Myanmar has had a “massive donor influx but very weak receptive capacity” and thus needed good donor coordination. The government has set up a foreign aid coordination committee. The World Bank’s engagement is “very preliminary”, she explained, although the Bank has opened an office it shares with the AsDB and the International Finance Corp. and is now recruiting staff. Instead, the AsDB has been doing economic and sector analyses and consulting stakeholders as it prepares an “interim country partnership strategy” for the next 18 to 24 months, Senga explained. But Dixon said that the Myanmar government has undertaken radical reforms in the economic, financial and political spheres. The government is drawing up a development plan, released to the public the whole IMF assessment of its economy, and for the first time discussed the budget, passed it in Parliament, and aired this on television. The changes underway in Myanmar are “an enormous challenge for the government, which has to get an idea of the sensible sequence of how to do things, need to show results quickly to its population which has high expectations, and embark on a process that we know takes decades,” Dixon explained. external-driven aid, but consultation with the grassroots community is crucial”. Thein Swe also said that while the government has made improvements in transparency, the fact remains that the lower house of Parliament in August rejected a motion that would have required all government officials to publicly reveal their assets. “It is shameful,” he argued. Both raised questions about the military’s continued role in the country, and said citizens need to get used to more political space and speak up. “We have to make sure that the role of the military will remain a positive one,” said Thein Swe. Under Myanmar’s constitution, the military get one quarter of seats in Parliament. 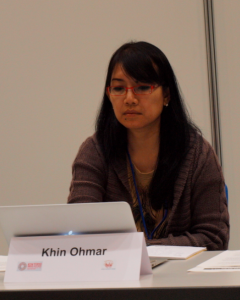 To see a video interview with Khin Ohmar, click here.